Lua error in Module:Location_map at line 488: Unable to find the specified location map definition: "Module:Location map/data/Lebanon" does not exist. Byblos is the Greek name of the Phoenician city Gebal (Greek: Βύβλος; Hebrew: גְבַל‎; earlier Gubla/Phoenician:𐤂𐤁𐤋). It is said to be the oldest city in the world (according to the ancient historian Philo of Byblos). 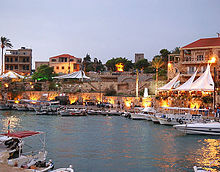 Byblos is a city located in Lebanon. It is called Byblos by the Greeks. The word Byblos appears in the Bible under the name Gebal. Gebal means mountains. The Greeks took the name of Byblos as their word for books, and from their word for books named the bible. There are a lot interesting places in Byblos. The most important ones are Old Souk, Qartaba, Faraya, Abraham River, Jeita Grotto and Byblos Wax Museum. Old souk is a place where you find everything old and with a cheap price. Qartaba is a village in byblos, Qartaba means good, curing and balanced weather. In winter Faraya has a cold climate and snow, Faraya means "The land of fruits and vegetables". Abraham River is a small river also called Adonis, Adonis means "The God Of Love". Jeita Grotto is one of the most beautiful places to visit. Byblos Wax Museum is a wax museum that present historical people and everything old. ↑ "Byblos". Ancient History Encyclopedia. Retrieved 2017-06-15.